Goodenia decurrens is a small erect shrub with multiple stems. The leaves are five to ten centimetres long, lanceolate with toothed margins. 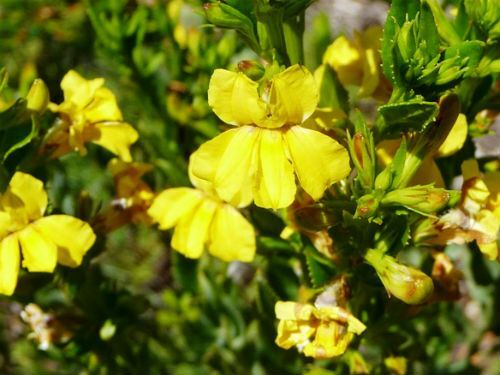 The profuse bright yellow flowers are about two centimetres across and are carried in dense clusters during the warmer months with sporadic flowering at other times. G. decurrens prefers well drained sites and, in our cold climate garden, is a blaze of colour during spring and summer. Pruning is necessary, after flowering, to keep plants from becoming straggly. 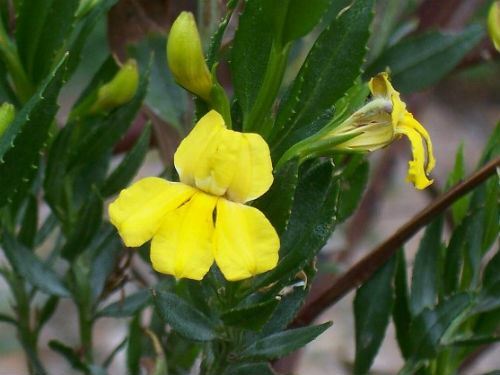 Goodenia decurrens is a native of NSW and occurs on the Central Coast, Central Tablelands and Western Slopes. Many years ago, on a trip through the Hunter Valley, central NSW, we found some very dishevelled specimens growing along a roadside. Cuttings were taken and now G. decurrens is a prominent feature in our cold climate garden. Cuttings strike rapidly from cuttings.